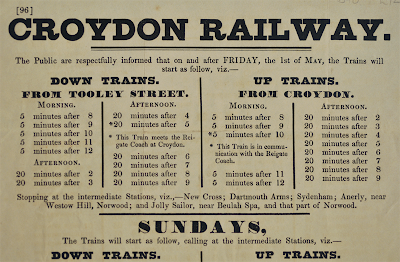 The coming of the railways in the 1820s gave rise to a new world of reading: the timetable (of a coach service, for example) had previously been presented in the form of a list, with departure times from a public place, often an inn. 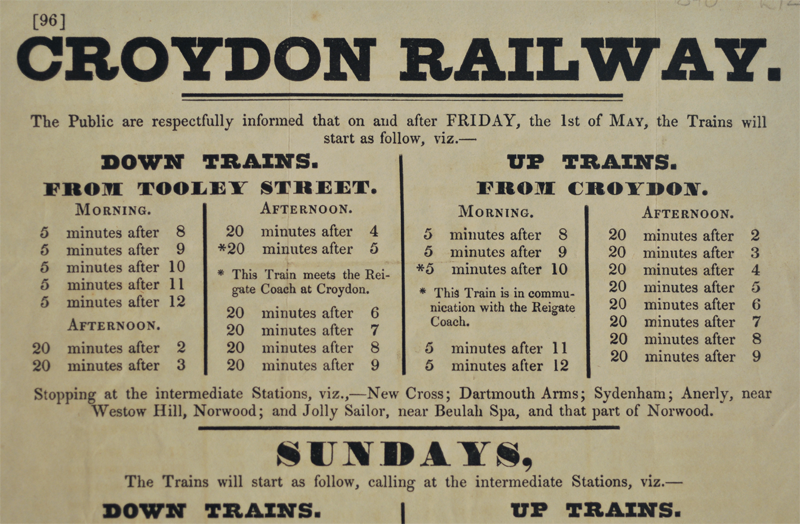 This early railway timetable, from the exhibition based on the ‘Designing information for everyday life, 1815–1914’ project, shows a stage of development. Bold types are used: the volume of material to be read, and its potential complexity, requires the reader’s gaze to be directed and organized by strong colour contrasts. The text is beginning to detach itself from the linear, sentence-like prose of earlier timetables, but has not yet resolved itself into a fully tabular form. That would come very quickly: this example is dated 1840; by the mid-1840s the fully tabular timetable was established. In this example, bold is used to provide a hierarchy of headings, and assist navigation around the document, rather than highlight elements at text level within a part of the document. The new railway traveller is faced with some technical language to understand: ‘down’ means trains travelling away from the main terminus of the line (usually taken to be London); ‘up’ is a train returning to the main terminus. Was this terminology used by coaches before railways? Tooley Street station is now part of London Bridge station.